Maura loves words and has been writing ever since she can remember. Her children started music lessons at an early age, but never really enjoyed practising their instruments, often becoming frustrated when they couldn’t play the right notes. Maura thought learning a song should focus less on playing the notes correctly and more on experiencing and enjoying the music. 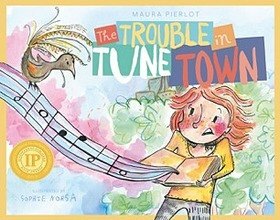 This was the inspiration for The Trouble in Tune Town, Maura’s first picture book, and its heartfelt message: If you’re having fun, then you're playing all right. Maura also writes for the stage and for young adults. Over the years, she has crafted news and information as a medical journalist, magazine editor, small business owner, marketing consultant and ethicist. She has a PhD in philosophy and enjoys talking about big ideas. Maura lives in Canberra with her husband and their three children, now teenagers. She loves the touch and feel of books, old typewriters, thunderstorms and cheesecake. She enjoys spending time with family and friends, and travelling to new places. She tries to learn something new every day, but to make it fun.